Where does the EU export to? The UK is the EU's single largest export market. That's right for the goods market. If you treated the UK as if it were out of the EU it would have made up 16% of the EU's goods exports in 2014. That's just ahead of the United States. Almost all European countries have a trade surplus with us, apart from five. Over the last ten years all EU countries other than three sold more to us than they bought—Ireland, Luxembourg, and Malta. “Every single country in Europe apart from Ireland, Cyprus, Greece and Malta and Luxembourg have a surplus with us”. The UK is the EU’s largest single export market in goods, if you treat the UK as if it were outside the EU. The United States is a close second. They make up 16% and 15% of exports to non-EU countries respectively. This assumes exports to the UK would be the same if we weren’t an EU member. Mr Moynihan was actually a little generous with the number of countries he named as not having a surplus with us. Over the last ten years, on average only Ireland, Luxembourg and Malta didn’t. We’re only analysing the statistics here. While it’s fair to say we’re an important trading partner with the EU, it’s a more complicated matter to assess what kind of trading relationship the UK would have with the EU if it leaves. If the UK wasn’t a member of the EU it would be the group’s largest single goods export market, at least if we assumed that not being a member wouldn’t have an effect on trade. The United States would be a close second. 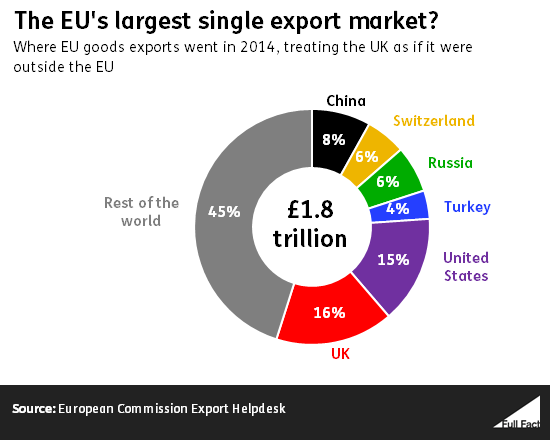 That’s not to say that the UK accounts for the majority of exports that the EU sends out. It makes up about 16% of goods that the EU exports to the rest of the world (plus the UK). Countries within the EU export a lot to other countries within the EU. If you’re also counting exports to countries within the EU, Germany receives the largest value of exports. Vote Leave told us Mr Moynihan was talking about trade in goods. All our data here comes from the European Commission. There are a variety of figures available for trade in services, which is why Vote Leave said this was excluded. We’re getting in touch with Eurostat to work out which figures are the best ones to use. Up until now we’ve been covering goods exports. John Moynihan’s claim brings trade in services into the picture as well. Mr Moynihan said that every country in Europe apart from Ireland, Cyprus, Greece, Malta and Luxembourg has a trade surplus with us. That means most of our neighbours sell more to us in goods and services than they buy from us. Vote Leave told us the source of the claim was analysis by Business for Britain, which had looked at the average goods and services trade flows with each EU member country from 2004 to 2013. Every country but three—Ireland, Luxembourg, and Malta—had a surplus with us by that measure, according to data from the Office for National Statistics. That doesn’t change if you look at the decade to 2014. The last two sentences were updated to clarify that we were referring to a 10 year period in our analysis of the more recent data, and that both sentences were based on data from the ONS.